Clocks, watches, the time on your computer and the internet - we watch our time with great concern. Meeting targets in the office environment can be better achieved with a good quality Clock for Business Gift to ensure top productivity and time effectiveness! Perfect for a business gift or company freebie you can send to a customer and ensure brand name awareness and retention of your company brand name and logo at regular intervals. Ensure to customise your Clock for Business Gift for maximum effectiveness. 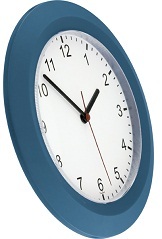 Why not tailor this promotional clock to your needs and have it on the wall of your customer's office? * Branding: Full colour printing!